Brick a building material made of clay, moulded commonly in rectangular blocks, and baked. The most ancient records make mention of their use. The early inhabitants of Babylonia found on the plain in the land of Shinar the clay for their construction, and " said one to another, Go to, let us make brick, and burn them thoroughly; and they had brick for stone, and slime had they for mortar." (Gen. xi. 3.) The slime was probably the semi-fluid bitumen used at early periods in Egypt and Babylonia as a cement; and no better building materials have ever since been used than those ancient bricks, and the natural mortar employed to bind them together. The walls of Babylon were built of burnt bricks laid in bitumen, as were the exterior walls of the still existing mounds, the largest of which is supposed to have been the tower of Babel. The interior of this mound is filled with unburnt bricks set in clay, with layers of reeds between every five or six courses. In other parts of the work the bricks were laid in lime mortar of exceeding toughness. From the frequent reference to the making of brick in the Old Testament, the manufacture appears to have been an important one with the Israelites and Egyptians. It was a principal task imposed by the latter upon their captives. The gathering of straw and stubble for mixing with the clay indicates that they were sun-dried, like those seen at this day in some of the pyramids of Egypt. Upon one of these, probably the brick pyramid of Howara, 10 leagues from Cairo, was formerly an inscription, cited by Herodotus, of which the following is a translation: " Do not undervalue me by comparing me with pyramids of stone. For I am better than they, as Jove exceeds the other deities. I am made of bricks from clay, brought up from the bottom of the lake adhering to poles." The same material was used for other structures of high antiquity. The Greeks gave particular attention to having them perfectly adapted to the use to which they were to be applied; in some instances, as stated by Pliny, not allowing them to be used until after they had been seasoned five years, and had received the approval of a magistrate. The palaces of Croesus, king of Lydia, of Mausolus of Halicarnassus, and of many other Asiatic sovereigns, some of the temples of Athens, and the walls of that city looking toward Mount Hymettus, were built of this material. The Romans perfectly understood the art, as the bricks in the baths of Titus and Caracalla bear witness. The stone of the Colosseum has not proved so durable. In the ruins of their forts, walls, etc, in Great Britain, they are found of an excellent quality, of a deep red color, well burnt, and very hard. The brick made by their successors in England was not particularly noteworthy until about the middle of the 14th century. In the time of Henry VIII. and Queen Elizabeth so good an article was produced, that it was employed in the construction of many fine edifices. In modern times the manufacture is more remarkable for the immense scale upon which it is conducted, than for the good quality of the product - a fact attributed by English writers to the practice so generally adopted in London of building houses upon lands leased for a certain period, at the expiration of which the property reverts to the owner of the ground. The Dutch appear to have succeeded better than the English to the skill of the Romans. Their bricks have been famous from an early period for soundness and durability. So substantial were they, that they served well for the floors of houses, and even for street pavements. Specimens of Holland brick, brought over by the early settlers, are to be met with in some of the old Dutch houses of New York. Among the Asiatic nations the manufacture has continued at a high degree of excellence from the remotest periods. In the hilly country of Nepaul bricks are made of such remarkably compact texture, and so elegantly ornamented upon their surface, as to be peculiarly fitted for architectural decorations. The Chinese give to the face of their brick the texture of porcelain. The ancient Peruvians excelled in the manufacture of brick, as in many other of the useful arts. Ulloa, after carefully examining the large bricks, was confident there must have been some secret in their composition, which was lost in his time, so superior were they to those made by any process then known. They are described by Prescott as large blocks or squares, made of a tenacious earth mixed up with reeds or tough grass. - The plastic nature of clay, and its property of hardening by heat into a substance like stone, are qualities so obviously adapting it for building purposes, that no people requiring permanent dwellings have failed to perceive them, and availed themselves of its use. But clay is not uniform in composition, and much of it requires some admixture of other substances. The purer aluminous earths consist of about two parts of silica to one of alumina, together with a larger or smaller proportion of water. They are remarkable for their plasticity, and mix freely with any quantity of water. But such materials, if moulded and baked, would shrink greatly and bend and warp; cracks would be produced from the outside hardening before the moisture of the interior could escape through the viscid mass. Such rich or fat clays require to be tempered with sand, or cinders and ashes, which render their texture more open, so that they retain their form; but they may without this tempering serve for baking into thin sheets as tiles. The quantity of sand or other substance required for any clay can only be determined by actual experiment. Some clays contain a proper proportion of sand naturally mixed with them. Others contain too much, and the bricks from these will fall to pieces. Admixture of fatter clays is the only method of making such useful, unless an expensive process be adopted of suspending the earth in water, and drawing off and collecting that which is held longest in suspension. Besides sandy clay or loam, calcareous clay or marl is sometimes used for the manufacture of brick; but if much lime be present, the compound may be too fusible to answer the purpose of making good brick. Oxide of iron is rarely absent. In the process of burning it is converted into the peroxide, and imparts to the whole brick its red color, more or less deep according to the degree of oxidation. The more free the clay is from other ingredients than silica and alumina, the better the bricks made from it withstand high temperatures. Clay taken freshly from its bed, even if of suitable composition, is not in a condition to be at once moulded into brick. It must first be exposed to the weather until its particles are disintegrated, when it can be kneaded into a mass of uniform consistency. This is best effected by the action of frost, the water diffused through the substance expanding by freezing and breaking it in every direction. The longer the exposure is continued, the more effectually is the clay reduced. This is followed by covering the clay with water and leaving it for a short time in a pit or tank. The kneading was formerly conducted by treading of horses, oxen, or men, and the work was no doubt more efficiently done by the naked feet of men than by the machinery afterward introduced for this purpose; for the lumps, stones, sticks, etc, mixed with the clay were thus readily detected and removed. The pug-mill is the first form of machinery introduced for grinding the clay. It is a conical or cylindrical tub, standing on end, with a shaft passing vertically through it, armed with blades, which cut and knead the clay delivered in the top, forcing it down by their oblique position to the line of the shaft, as this is carried round by a horse attached to a horizontal arm. The clay thus ground and kneaded continually passes through an opening in the bottom of the mill, and is then cut into convenient pieces and stacked away for use. It must then be handled again for moulding it, and the practice was formerly to forcibly throw a quantity into the mould, which was a box of wood or of brass without top or bottom, and then strike off what was superfluous. The mould is always sanded to prevent the clay adhering to it. A box containing a row of five or seven moulds open at bottom was afterward contrived to run in under the lower part of the pug-mill and receive the clay, the further exit of which was at the same time arrested until another box of moulds replaced the one just removed. The work was thus rendered more expeditious with less expenditure of labor. In whatever way the kneading is conducted, especial care is taken to separate from the clay roots, sticks, and pebbles, the presence of which in the bricks would disfigure and weaken them. Even if the stones were buried in the interior of the bricks, a cavity would be left around them, for the reason that the stones first expand while the clay contracts by heating, and afterward contract by cooling in a much greater degree than the clay. In tempering the clay, it was found highly advantageous at the great brick yards near London to introduce a portion of coal ashes, which always contain more or less fine coal. The use of fine anthracite was introduced for the same purpose at the kilns on the Hudson river in 1838, and has been found so serviceable that it has been ever since continued. The quantity employed is about 75 bushels to 100,000 bricks. It is thoroughly intermixed in the kneading, and has the effect of saving a portion of the fuel, while it diminishes the time of burning; the quality of the bricks, however, is not so good as of those made in the old way. For drying the bricks previous to baking, the first requisite is a smooth level yard fully exposed to the rays of the sun, or, if covered by a roof, open to a free circulation of air all around. To this the moulds containing the bricks are brought, and, being placed upon the ground, are cautiously lifted off, leaving the bricks behind. They are arranged in rows, and in case of rain, if not under a roof, must be covered with boards, as they are in danger of being washed away. The drying should be thorough, or the bricks will be likely to crack in baking. After depositing the bricks on the drying floor, the moulds are taken back, are dipped in water, and then into sand, and are ready to be refilled. When well dried the bricks are removed to be baked. This is effected in England sometimes in permanent kilns, which hold as many as 20,000 bricks, and are filled and emptied like those for baking earthen ware, the burning being completed in about 48 hours. The method in common use in this country of piling the green bricks upon one another to make their own kiln is also adopted there; but the arrangement is called a clamp instead of a kiln. By this method half a million bricks, or even a million, are burned in one operation. A central double wall is built lengthwise along the kiln, its lower portion of bricks already baked, and on each side are parallel longitudinal fire flues built of un-burnt brick, laid very open; over them the great body of brick is piled after an exact system, vertical flues ascending to the top, and the whole work being laid in an open manner for the free circulation of the gases. The fires are made in one end of the flues, and the heat is increased by the combustion of the small coal which was scattered throughout the heap as it was built up. The top and sides of these clamps are usually built of bricks that have been already once baked. The underbaked bricks of previous firings may thus be conveniently finished. Over the whole a covering of loam is sometimes laid to prevent the fire from burning too rapidly; and screens of wood or other material are used to protect portions against the wind. The time required to burn a kiln varies with its extent and the manner in which it is fired. The English accounts state: "So very slow is the progress that bricks in the neighborhood of London take about three months in the burning." The time formerly required on the Hudson river for burning the great clamps of from 300,000 to 1,000,000 bricks was about two weeks, and the consumption of oak wood was about 40 cords to 100,000 bricks. The quantity usually regarded as sufficient is, however, 33 1/3 cords. After the introduction of anthracite dust in the clay, the time of burning was reduced to three or four days, and the consumption of fuel to 16 cords to 100,000 bricks. . The mere expenses of burning this number of bricks are rated at $80 for 16 cords of wood, $3 for 75 bushels of anthracite dust, and $6 for 4 days' attendance; total, $89. The preparation of the clay, moulding, drying, building up of the kiln, waste, etc, make all together a larger amount than the burning. As the bricks in a clamp are exposed to great differences of temperature, they are found of various qualities when the process of burning is completed. Those near the flues are partially vitrified and melted together. Many are slightly fused on the surface, and baked to a stony hardness. These are called clinker bricks, and are used in situations where they will be exposed to the weather or to rough wear. The soft bricks are selected to be laid for work in sheltered situations. The very slackest baked are returned to the next kiln. - The annular furnace for burning brick, invented by Friedrich Hoffmann of Berlin, is extensively used in Europe, and is said to possess great efficiency and economy. The following description and illustration are taken from Dr. Barnard's report of the Paris exposition of 1867. A large annular chamber, with openings at the sides for the reception of the bricks, is constructed with a central chimney, and with removable divisions for separating the annulus into different parts. When the furnace is filled with unburnt bricks heat is applied to one division, the smoke and hot air escaping into the adjoining one, which is the next to be burnt, the air for maintaining the combustion being received through the compartment last burned, whereby the bricks in it are cooled. Each compartment of bricks or other articles is thus burned in turn, the waste heat of the burning compartment continually drying the compartment before it, and taking all the heat of the one behind. The letters a a, fig. 1, mark the circular arched furnace, furnished with doors, b b. Flues, c c, lead to the circular chamber e e. surrounding the chimney, d. Valves of cast iron are made to close at pleasure the orifices of the flues. Movable sluices in the dividing walls allow of communication to be made or closed between the chambers; h h are plugs through which the coal, in powder, is introduced, undergoing calcination. The advantages of this furnace lie in its great economy of fuel. The heat is very equable, and no smoke is generated, the fuel being burnt while falling to the bottom of the furnace. - The immense consumption of bricks in cities has made it an important object to reduce the labor employed in their manufacture as much as possible, and consequently much ingenuity has been expended in devising machinery for grinding and moulding the clay. A great number of machines have been patented in this country and in Europe, but it has been found exceedingly difficult to render them practically successful. Two kinds of machines have been made, one by which it is sought to prepare the brick from clay which contains so little moisture that they may be immediately taken to the kiln, and another which moulds it in so soft a state that it requires to be dried before baking. The difficulty with the first method is that the bricks do not seem to possess the strength of those which are made of moister clay, and from the immense power required to press them to the proper size in the moulds some parts of the machinery are liable to break. Those machines which employ moist clay have been utilized in manufacturing pipe and tile and peculiar forms of brick; but in making common brick the saving of labor has not been found sufficient to make them take the place of hand labor, by which process nearly all the bricks used in building are made. - The red color of bricks is owing to the peroxidation of the iron contained in the clay. If the iron is deficient or only partially oxidized through insufficient heat, the bricks are of a pale color. The clay in the vicinity of Milwaukee, Wisconsin, is remarkably free from iron, and the bricks made of it are of a delicate straw color. Other colors may be imparted to brick, provided that of the oxide of iron does not overpower all other coloring matters introduced. American bricks vary in size in the different states, running from 7 3/4 to 8 1/3- inches in length, 4 to 4 1/2 in width, and from 2 1/4 to 2 1/4 in thickness. The weight is commonly reckoned at 4 lbs. to the brick; but this varies with the size, the amount of pressure to which the clay has been subjected, and the heat applied in baking. English bricks are commonly 9 inches long, 4 1/2 wide, and 2 1/2 thick. - Floating Bricks. A very light silicious earth is occasionally met with, of which bricks have been made that float upon the water. Clay may be added to the silica, if required to bind the material together. Such bricks were made in ancient times, and were described by Posidonius and Strabo, and particularly commended by Vitruvius, Pollio, and Pliny. In 1791 they were again brought into notice by Giovanni Fabroni in Tuscany, who after many trials succeeded in making bricks which would float upon water. Their strength was but little inferior to that of ordinary bricks. They are remarkable not only for extreme lightness, but also for their infusibility, and for being very poor conductors of heat. They may be held by one end while the other is red-hot. As an experiment Fabroni constructed the powder magazine of a wooden ship with these bricks. The vessel, being set on fire, sank without explosion of the powder. In 1832 Count de Nantes and Fournet, a mining engineer, used them in constructing powder magazines and other parts of ships, lessening danger from fire. Kutzing found the material from which these bricks were made to contain immense numbers of microscopic silicious shells of infusoria. Similar earth has been discovered in France and at Berlin, and it is probably the same whitish substance that is often found under our peat bogs. - Fire Brick. When bricks are required to withstand high temperatures, they are made of the most infusible clays, such as contain from 63 to 80 per cent, of silica, with from 18 to 25 per cent, of alumina, and the remainder water. Oxide of iron may be present, but the light color of fire brick shows that this is in very small quantity. Lime would render the mixture fusible, and this is necessarily always absent. Such clays are of common occurrence in the bituminous coal measures, where they are found making the floor or underlying stratum of the coal beds. The material is indurated, so that it is broken up like a soft stone. When used, it is ground in a mill, and mixed with fragments of previously baked fire brick, or of some refractory stone, or with a coarse, clean silicious sand and gravel. The materials are made into a paste with water, moulded in hand moulds, and baked in permanent kilns at a very high temperature. Good clay for fire bricks is also found associated with other clays of more recent formations. The potters' clay formation found at South Amboy, N. J., contains beds of excellent quality, together with others of very pure sand, suitable for mixing with the clay. The manufacture of fire brick has long been carried on at this locality. At Athens, opposite Hudson, on the Hudson river, good fire bricks have long been made. At Bennington, Vt., an excellent clay is found of the character of kaolin, from which fire bricks of very refractory quality are made by mixing with it stones that withstand heat, crushed sufficiently fine. These bricks are extensively employed at the blast furnaces in that part of the country. It is for the lining of such furnaces that fire bricks are principally in demand, and for this use they are prepared of a variety of sizes and shapes, adapted to fit the curves in the lining of the stacks and the arches of the flues. The standard size to which all the larger bricks are referred in reckoning their number, is that of the common rectangular fire brick, which measures 9 inches in length, 4 1/2 in breadth, and 2 1/2 in width; of these the weight is 7 lbs. These bricks, specially adapted to each pattern, are also employed as a lining for the anthracite coal stoves so extensively in use in the United States. - Bricklaying. The form and proportions of the faces of brick to each other are such that they may be laid in various methods, according as the object is to produce the greatest strength of wall or the most pleasing effects. Ornamental work, as cornices, beads, etc, is produced by causing courses of brick to project beyond the plane of the rest. By the introduction of mortar, bricks, notwithstanding their rectangular shape, are carried round to. form arches of any desired, curve; they are easily broken also into any required shape by the trowel, and thus are made to receive, if desired, the approximate form of an arch. Fire bricks, as mentioned above, are moulded in shapes for laying curves, as also common bricks for the lining of wells, etc. In laying walls, the first principle to be observed is causing the bricks of successive courses to overlap each other, so that the joint between two is overlaid by the middle of a brick. The courses are thus bound together, and the greatest resistance is offered to any force tending to separate the bricks. As the width of two bricks laid side by side equals the length of one, the position may be reversed with each course, thus securing additional strength. "What is called the old English bond method of laying a wall, which is the strongest mode, is to arrange the bricks in alternate courses of stretchers and headers, the former being bricks laid longitudinally with the wall, and the other transversely, presenting their ends or heads only to the face of the wall. Next the corner, a quarter brick on the row of headers must be introduced, so that the stretchers overlying may lap to the middle of the second headers. The headers are also called binders, from their effect in binding the bricks of the other courses together. Owing to their presenting a greater number of joints in the face of the wall, their effect is not so pleasing as is that of the stretchers. In New York city, it is required by the fire laws that one course in five shall be headers. This is effected, while stretchers only are seen on the face, by laying every fifth course in what is called herring-bone, breaking off the back corners of the stretchers to let the corners of the brick behind come nearly to the outside line of the wall. In the Flemish bond the bricks are laid alike in each course, a header and stretcher alternating along the course. The effect is more pleasing than the English bond, but at the sacrifice of some strength. Walls vary in thickness by the difference of the width of a brick. They are 8 inches or the length of a brick thick, 12 inches or a brick and a half, 16 inches or two bricks, and so on. Laid in English bond, all the bricks on one course must be placed in the same direction, even when the wall turns at right angles; and in turning the corner no two bricks must be arranged side by side, but the end of one must lap to the middle of the next contiguous to it, excepting when the quarter brick is introduced at the corner to prevent a continued upright joint in the face work. The work is strengthened by the occasional introduction of pieces of hoop iron, which bind it together. If bricks were laid dry, they would absorb the moisture of the mortar, and, the pores being filled- with air and the surface covered with dust, there would be no adhesion; but when the bricks are wet and the mortar moist, the evaporation makes the attachment complete. As the wall is built up, no part should at any time reach more than four or five feet above the rest; for unless all upon the same level settles together, cracks will be produced where the newer work is joined upon the older. In attaching new walls to old, a brick in every other course of the old work is drawn and the new work is toothed in. Fig. 1. 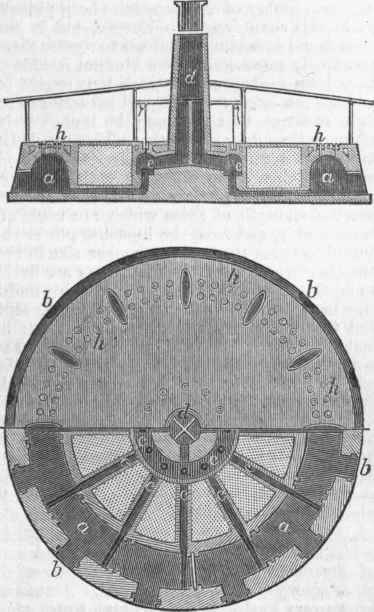 - Hoffmann's Annular Brick Furnace. Fig. 2. - Old English Bond. Fig. 3. - Flemish Bond.